Richard Carey reports from the Dust or Magic Institute held on November 4-6, 2007 on Mitchel Resnick's presentation. Dust or Magic is a critique of children's interactive media products released this past year, along with presentations on current research and the most current thinking on the children's interactive media space. Mitchel Resnick is an interactive media visionary. He directs the Lifelong Kindergarten research group at the Media Laboratory at Massachusetts Institute of Technology and develops technologies to engage people, particularly children, in creative learning experiences. In his presentation at Dust or Magic he shared his latest research and gave an update on Scratch, the programming language he and his team developed. Scratch is a new programming environment that kids can use to create their own animated stories, video games, and interactive art -- and share their creations with one another across the Internet. With this new software kids can program interactive creations by simply snapping together graphical building blocks, much like LEGO® bricks, without any of the obscure punctuation and syntax of traditional programming languages. Children can then share their interactive stories and games on the Web, the same way they share videos on YouTube, engaging with other kids in an online community that provides inspiration and feedback. Kids learn important computational ideas as they transform images, mix in sound clips and drum beats, and integrate inputs from real-world sensors. Resnick's Lifelong Kindergarten research group previously developed the "programmable bricks" that inspired the award-winning LEGO® MINDSTORMS® robotics kits. 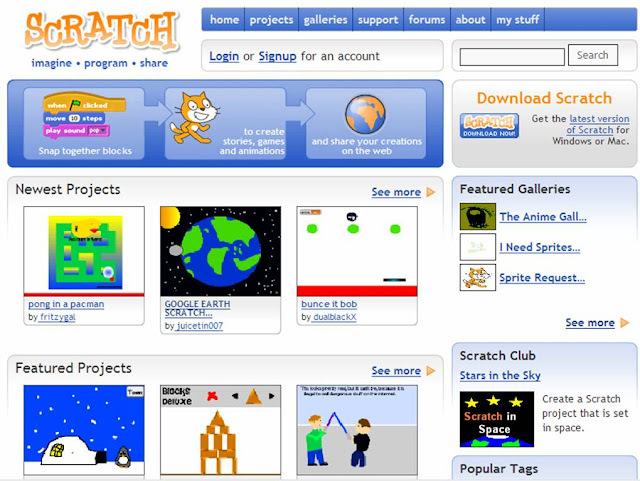 Just as MINDSTORMS allows kids to control LEGO creations in the physical world, Scratch allows them to control media-rich creations on the Web. "As kids work on Scratch projects, they learn to think creatively and solve problems systematically -- skills that are critical to success in the 21st century," said Resnick. Designed for ages 8 and up, Scratch is available by free download from the Scratch website (https://scratch.mit.edu/). The software runs on both PCs and Macs. 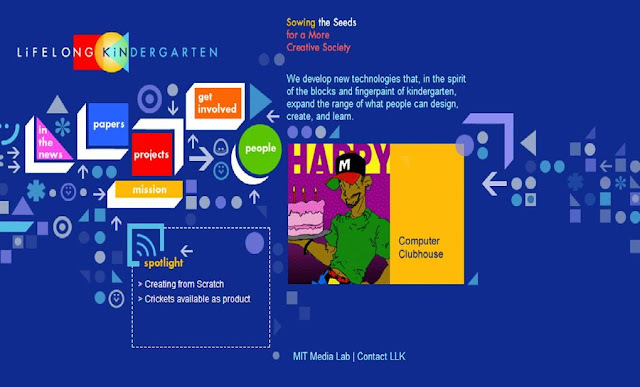 The MIT Media Lab is collaborating with other organizations -- including Intel, Microsoft, Samsung, BT, the LEGO Group, Motorola, and One Laptop Per Child (OLPC) - to create other versions and applications of Scratch, including versions for mobile phones. The name Scratch comes from the technique used by hip-hop disc jockeys, who spin vinyl records to mix music clips together in creative ways. Similarly, Scratch lets kids mix together a wide variety of media: graphics, photos, music, and sounds. A glance at the Scratch website reveals a kaleidoscope of projects created by kids: a story about a polar bear school, space attack games, and a break-dancing performance. Some creations are goofy and fun; some reveal serious social themes. Children are constantly modifying and extending one another's projects on the website - and learning from one another in the process. "It's exciting to wake up each morning and see what's new on the site," said Resnick. 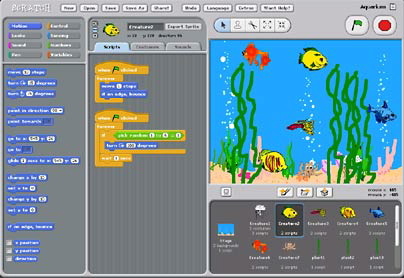 Scratch was developed by the Lifelong Kindergarten research group in collaboration with UCLA educational researchers, with financial support from the National Science Foundation and the Intel Foundation. 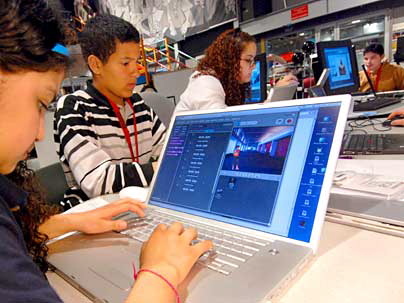 Throughout the development process, the design team received feedback from children and teens at Intel Computer Clubhouses and school classrooms. Dust or Magic is an annual show-and-tell review of the past year in children's technology. The demonstration-intensive three day institute is designed for individuals who need to understand the latest children's interactive media products, in the context of known theories of child development and play patterns. Because participants stay at the same Inn and come from a variety of perspectives, the event has a retreat feel to it. Time is put into the agenda so that there are opportunities to try out the latest products in both formal and informal settings. As with previous Dust or Magic Institutes, the agenda is planned around the products, and videos of child testers using key products help ground the discussion. Throughout the session, there are presentations by developers, reviewers and researchers on current topics.